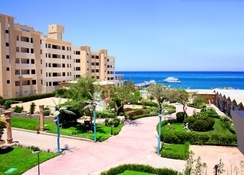 The King Tut Resort Hurghada is a great choice for both beach lovers and business travellers. Not far from the sandy beach, the Egyptian 4-star hotel makes holiday dreams come true. 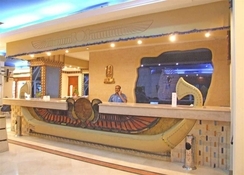 The hotel’s foyer invites you to linger offering a few glimpse of the Red Sea. The terrace or the sun terrace in the holiday hotel in Hurghada also invites you to soak up the sun. The 135 guestrooms in the hotel offer amazing views of the sun, sand and sea. This beautiful hotel holds small souvenirs in various shops inside its premises. The hotel complex has its own supermarket. Nearby tourist attractions in this region include the aquarium and the Coptic Church of St. Shinoda Father of the Hermits. 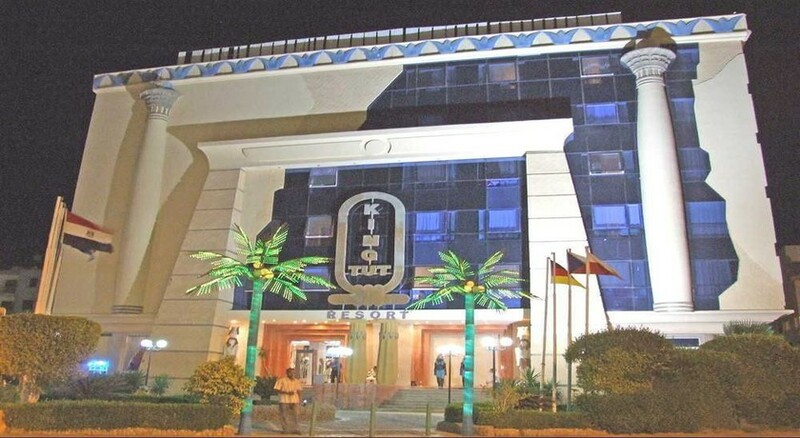 King Tut Resort Hurghada is located right on the beach, and is close to several tourist attractions in Hurghada. A visit to the Giftun Island is a must during your stay in Hurghada. The Mini Egypt Park is about 33km, while the Jungle Aqua Park is 22km from the hotel. 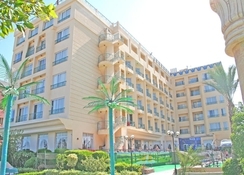 The nearest airport – the Hurghada International Airport is about 12km from the property. You will feel at home in any of the 135 rooms. Each hotel room has a bathroom equipped with a hairdryer and toiletries. The comfortable seating area is decorated well and offers a warm cosy ambience. The room amenities include a minibar, a safe and a desk. In-room facilities include a fridge, microwave and coffee maker. There is a telephone and a TV unit. Your wonderful holiday in Hurghada will only be embellished at the scrumptious restaurants at the King Tut Resort. The service team at the hotel will surely spoil you with culinary delights including a buffet breakfast, lunch buffet and evening buffet. For a snack in between, detour to the hotel’s snack bar. Late risers will appreciate the breakfast for late risers during their holidays on the Red Sea. The hotel features a café where soft drinks and alcoholic beverages are offered. In the wellness area of the hotel guests find an inviting Jacuzzi. They can relax at the outdoor pool, which has sun loungers dotted around it. The beauty section offers beauty and body treatments and massages. There are sports facilities at the hotel, such as table tennis, billiards, darts or volleyball. Children are invited to conquer the hotel's own playground. Horseback riding, surfing, diving, fishing and snorkelling are all close to the property. The complex also includes a karaoke bar.